Appointing and training Fire Wardens/Marshal will provide management with the opportunity to significantly improve fire safety practices in the workplace, improve communications and share the workload in the implementation of good fire safety management. This course provides a clear understanding of the responsibilities, duties and role of the Fire Warden and Fire Marshal. The objective of each course is to give delegates all round knowledge of the duties of a Fire Warden/Marshal. 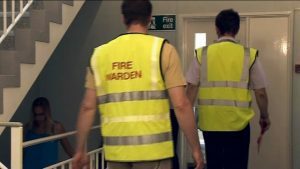 Every Fire Warden (Marshal) course is reinforced with videos and questionnaires to help delegates retain the information. Any further questions on our Fire Warden (Marshal) Training Course? If you would like to find out more about the Fire Warden (Marshal) course, or if you cannot find the fire safety training or fire extinguisher which you are looking for, give us a call on 028 2564 5374. we can create bespoke training tailored to your company’s specific requirements. Please contact us to discuss your needs.